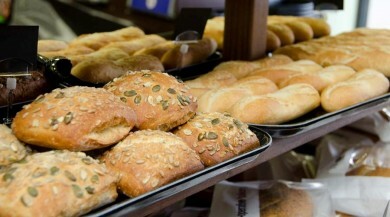 It’s one of Scotland’s best-kept secrets – The Breadwinner Bakery in Edinburgh where Master Bakers, using traditional, simple methods, lovingly create a breathtaking range of artisan breads, cakes and pastries Scotmid Food customers can now discover for themselves some of the bakery’s amazing hand-crafted products. Sharing the same ethos as Scotmid, The Breadwinner’s products use the freshest possible ingredients and, where possible, these are sourced from local suppliers. Wholesome and natural, everything that leaves The Breadwinner is freshly baked and packed full of flavour. Baking for 40 years, this great bakery produces a wide range of products, including many vegetarian savouries, so there’s something for everyone – and you may already have tasted produce from The Breadwinner in restaurants, bistros and cafés throughout Edinburgh and further afield. In fact, The Breadwinner’s reputation is spreading faster than the butter on your knife with the bakery creating unique artisan breads especially for The Open Hospitality, the fine-dining facility at The Open Championship at Muirfield in 2013, and Chanel’s fashion extravaganza at Linlithgow Palace in 2012. Once you’ve tasted The Breadwinner, bread will never taste the same again. You’ll find a comprehensive range of products in Scotmid stores in and around Edinburgh, with more to follow.